I’ve been MIA lately…we’ve had lots of visitors. So, I just want to wish everybody a Merry Christmas and Happy Holidays! Talk with you on the flip side. (You know you wanted to see this one again)! Merry Christmas!!! Have a great holiday!! OH you know we could never get enough of that pic!!! Best Christmas Photo!! haha – MERRY CHRISTMAS!!!! I don’t think I could be a bigger fan of your children. Merry Christmas! That picture is very cute. Merry Christmas…I LOVE the card. That is just awesome! Merry Christmas! Hope your holiday is great! Thanks for stopping by to visit my blog the other day! I STILL think that picture is hysterical!! Merry Christmas Krystyn to you and your family! 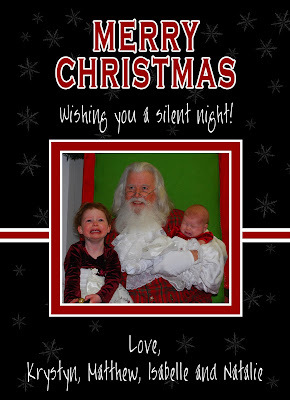 Merry CHristmas to you too…and haha…yep, I”m still chuckling over that photo!! Hope you all had a wonderful Christams Krystyn! Hope your holiday was awesome! Oh yes, I STILL love this picture!! Merry Christmas – wish you much sleep in 2009! Hope you had a great Christmas! Love the photo!!! Merry Christmas! You and me both with the visitors. Although mine happen to be unwanted at the moment…ugh! How much do I love your card?